Prince of Wales and Duchess of Cornwall being welcomed by members of Cabinet during Royal visit on March 21, 2019. 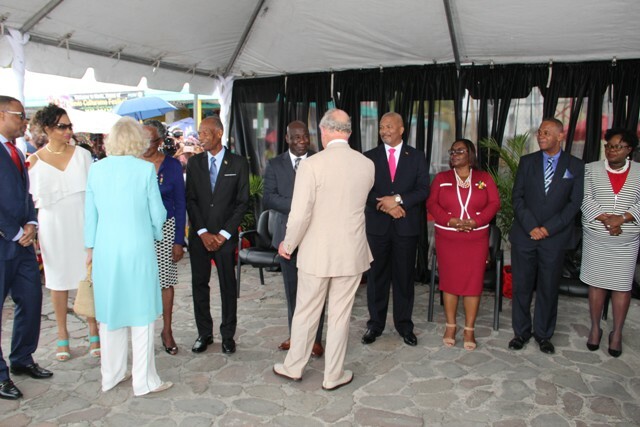 NIA CHARLESTOWN NEVIS (March 23, 2019)– Their Royal Highnesses the Prince of Wales and the Duchess of Cornwall, Prince Charles and Camilla Parker-Bowles paid a visit to the Federation of St. Kitts and Nevis on March 21, 2019. 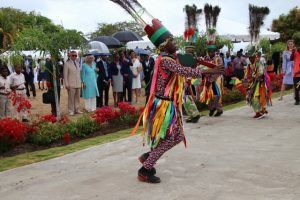 Their visit to the Federation was part of the Royal couple’s 2019 Tour of the Caribbean, participating in more than 50 engagements on 10 islands. On the Nevis leg of the visit, the Royal couple, on their arrival at the Charlestown Port, were greeted by a welcome party, comprising of Deputy Governor General Her Honour Hyleeta Liburd, Premier of Nevis Hon. Mark Brantley, Deputy Premier Hon. Alexis Jeffers, Hon. Spencer Brand, Hon. Eric Evelyn, Hon. Troy Liburd and Hon. Hazel Brandy-Williams, as well as scores of students and members of the general public. The Prince of Wales and the Duchess of Cornwall were escorted to Government House at Bath Plains, where a reception had been planned for the Royal couple. It included cultural presentations by the masquerades of the Nevis Cultural Development Foundation, the Bath Village Community Tourism Group, and the Charlestown Primary School Pan Jammers. 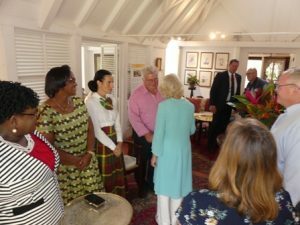 While His Royal Highness Prince Charles departed the island, to return to St. Kitts to participate in engagements planned there, following a private lunch, the Duchess of Cornwall and the Deputy Governor General visited The Hermitage. Before it was transformed into a plantation inn, The Hermitage was a Great House built sometime between 1670 and 1740. Today, it is a plantation inn that offers traditional Nevisian hospitality and lifestyle for up to 35 guests, who stay in reconstructed gingerbread cottages “uniquely-named for the stories they tell.” A “must see” on Nevis, The Hermitage boasts of original cuisine, a collection of antiques, old-fashioned gardens, horses, carriages and local arts and crafts.